NEW YORK - The Bronx Bombers were out in full force on Thursday night, stealing a line from their cross-town rivals' theme song; all told, they socked five home runs over the wall, plating all seven of their runs via the long ball in a 7-3 win over the Texas Rangers. These weren't your garden-variety home runs, either, as all five carried some sort of cache. The first came courtesy of Aaron Hicks, whose two-run shot in the first gave him 20 on the season, extending his career high and making him one of now four Yankees to reach that plateau this season. "I wanted to try to stay healthy all year and hit 20 homers; those were big things for me, and I was able to do that tonight," Hicks said. "(Aaron Judge) and I were talking about it after I hit 18, that I kind of wanted to go 19-20 to not get stuck, but it was fun to be able to do it for sure." "We started to see last year that he's a really talented player, and it's just quality at-bats from both sides of the plate," Boone added of his center fielder. Numbers two and three came from Miguel Andujar and Neil Walker, who went back-to-back in the fourth to give the Yankees a 5-1 lead, and the fifth and final homer also belonged to Walker; that was a solo shot in the sixth that made it 7-1, and gave Walker not only his sixth career multi-homer game, but also his first from both sides of the plate. "That's special for a switch-hitter for sure," Walker smiled, "but I think when you're barreling balls up from both sides of the plate, whether it's in the same game or the same series…that's kind of your goal as a switch-hitter. That's kind of the mentality of what you're trying to accomplish, and a good sign your timing and rhythm are where they need to be. And, obviously, the consistent at-bats certainly help." Oh, and in between? Just your garden-variety opposite-field blast from Giancarlo Stanton, one that went 449 feet with a 17 degree launch angle and 121.7 MPH exit velocity - the fastest for a home run in the Statcast™ era. "A couple of guys told me about that afterwards…it was pretty cool," Stanton smiled, "but in general, I don't get caught up in all that. I've seen balls 95 MPH go over, so as long as you get enough." "I still get amazed at how hard he hits the ball when he really squares it up," Boone said. "You see it come off the bat and everyone is taken aback, and you're wondering where it's going to land. And then, everyone looked at the scoreboard for the exit velo, and we all thought that might be the hardest one." All that backed a strong outing from J.A. Happ, who returned from 10 days on the disabled list with hand, foot, and mouth disease to throw six innings of three-run ball. He showed little if any ill effects from the sabbatical, taking a no-hitter into the fourth until Jurickson Profar homered, and only ran into trouble in the fifth when a leadoff walk, a blooper, and a hard-hit double led to Texas' other runs. "That's never a good thing, especially after we score some runs," Happ said specifically of the fifth, "but I was fortunate to get out of there and get through six. I felt fine physically tonight, so I was trying to go out there and attack, and be confident from the get go." 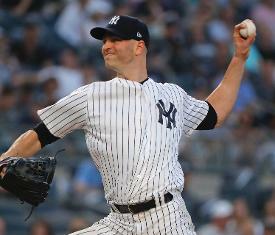 Both of Happ's Yankees outings have ended in quality starts, and this one was especially satisfying given how taxed the Yankees' bullpen has been over the last week. "We needed a good outing and some length today, and with J.A. coming off the virus, we were hopeful that he was in a good place, but you never know how that will show itself," Boone said. "But, he did really well; he wasn't perfect with his command, but you saw the ability to make pitches in different spots. He's really steady out there, and to give us six strong innings was just what we needed." "I knew that we needed some innings, so I did what I could," Happ added. "I would've liked to have gone one or two more, but I think after a layoff, I think that was a good start." Pre-game, the skipper had hoped that, after a sweep of the White Sox in Chicago, the Yankees could rebound from a long night - the team arrived back in New York around 4 a.m. - and come out with the energy they needed. With the win streak now up to four, consider that mission accomplished. -For the first time in franchise history, the Yankees have four players with at least 20 home runs through 114 games. Here's the skipper on that feat: "It really is amazing, knowing what this organization has been from a power standpoint. That's a pretty impressive feat." -Here's fellow switch-hitter Hicks on Walker's first-ever multi-side multi-homer game: "It's special. I feel like switch-hitters are kind of a dying breed, so it was fun to see him do it today." -Regardless of which side Walker's swinging from, Boone is happy to have him in the lineup right now: "I know what kind of hitter he is, so it's nice right now, when we are beat up, that he's swinging the bat like the Neil Walker we've seen, and giving us the positional versatility he brings." -Happ still doesn't know how he got hand, foot, and mouth disease, but if it slowed down anything, it was more his acclimation to his new clubhouse: "No one in my family has it, so it was just a random thing I guess, but really, I was in the clubhouse for two days, then had my start, and then I was gone for 10, so I kind of have to start the get to know you process going again!" -Aroldis Chapman had a bit of a hiccup in the ninth, walking his first two batters and showing diminished velocity, but he was able to escape with a scoreless inning. He did not appear in the clubhouse after the game, but here's Boone on his closer: "I think he's okay physically. He was just fighting his command a little bit there, but did a good job of battling through and figuring it out on the fly, and mixing in his slider to grind through a tough one. We want to make sure we get to the bottom of it and get him in line and throwing the ball like he can, but I do think (the velocity) is just a little more mechanical, him trying to get his sights and maybe being just a tick out of whack right now, but we'll dive into things and hopefully get him corrected." -Last word goes to Boone as well, this his answer when asked how much of a difference maker Stanton could be in a short series, such as, say, an ALDS: "He's a superstar player who, with one swing of the bat, can change the game as much as anyone in our sport, and when our lineup is whole, it's another massive presence you have to work through. We're built so that it's a challenge to go through our lineup over and over again, and he's one of those major challenges, and even when you get him, or anyone else, out, hopefully we're making it difficult and stressful on a pitcher."